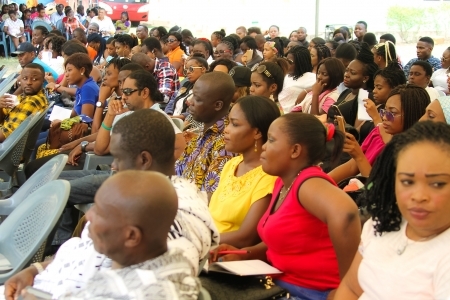 Nearly 300 Marshalls students participated in the 2nd Strategic Lakefront Rendezvous held in Akosombo in the Eastern Region. This year’s event was on the theme Academic Excellence and Value Creation. It was hosted on the properties of Marshalls’ 110-acre permanent campus, currently undergoing development, on the corridors overlooking the Akosombo lake. In attendance were Professor Benony Kortatsi and Mr. Mike Arthur, the President and the Vice President of Marshalls respectively, Dr. Tetteh Nettey, Group President of the Meridian-Marshalls Holdings, Mr. Bruce Potter, the National Vice President of the Ghana Hoteliers Association, and Nana Ansah Prem IV, the Chief of Akosombo, who was in the company of his two brothers and the Kontihene of Akwamufie. Faculty members and administrative staff, as well as both final year and Level 300 students of the College were also present. The event itself began with an opening address by Dr. Tetteh Nettey. He gave a brief overview of the Marshalls Strategic Lakefront Rendezvous and also took advantage of the moment to commend the final year students who had braced the challenges and were on course to historically become Marshalls’ first graduate class. This year’s graduation will be the first of its kind at Marshalls, since the inception of the institution in September, 2013. Mr. Bruce Potter, the Chief Executive Officer of the Holiday Inn Resort, then gave the keynote speech. He was rightly introduced by Ms. Joanna Mills-Odoi, acting Dean’s deputy of the Marshalls School of Arts and Social Sciences, whose flagship Hospitality and Tourism Programme has been immensely supported by Mr. Bruce Potter’s Holiday Inn. Mr. Potter endeared himself especially to the students during the Question and Answer segment, of his speech where he expertly addressed issues relating to the handicaps of the Ghanaian educational system and recommended solutions to them. In conclusion, he announced plans to increase internship slots at Holiday Inn for students of Marshalls. Since developing a partnership with Marshalls in 2014, Holiday Inn have offered valuable internship packages for students of Marshalls’ flagship Hospitality and Tourism programme. Marshalls President, Professor Benony K. Kortatsi then took his turn to speak to the Final Year students on the authorized requirements for graduation. He also announced plans to restructure the Project Work requirements in-house by the beginning of the next academic year in order to adequately prepare students for their presentations. Ms. Sarah Opoku, Quality Assurance Officer at Marshalls, also presented the Academic Performance Analysis chart. The event climaxed with a breakout session. The students were divided into ten groups to discuss methods for improvement of services and academic development at Marshalls. Group leaders then presented their findings, which were evaluated and addressed by the Marshalls Executive Committee, the Faculty and the administrative staff. The Vice President of Marshalls, Mr. Mike K. Arthur, then reoriented the entire Marshalls community on the institutional requirements of students. Participants of the Rendezvous also had the opportunity to tour the ongoing development projects on the Marshalls- Akosombo campus site. The campus is expected to host several state-of-the art facilities and modern learning technologies, including a Silicon facility projected to be possibly the biggest in Africa. The Marshalls Lakefront Strategic Rendezvous is held once every academic year and is geared towards re-orienting both students and faculty members to the Marshalls vision, as well as the academic objectives for the year.